Connect the Coca-Cola Company to its consumers in 2025! Do you remember the last time you have been in contact directly with a brand? How did you feel? Did you feel special? Unique? Entertained? Amused? Was this experience useful? Fantastic? Personalized? The Coca-Cola Company offers a wide variety of beverages with leading global and regional brands. They are refreshing people’s lives as they provide beloved drinks globally and they are inspiring happy moments through their communication and involvement in sports & entertainment. Today they want to bring this connection to the next level. 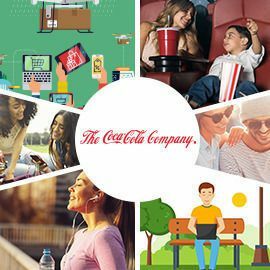 We would like you to imagine how The Coca-Cola Company could connect directly to consumers in 2025 (beyond just the delivery of beverages) and would like to know where your inspiration comes from. Imagine a unique, direct-to-consumer experience or service The Coca-Cola Company could provide to consumers in 2025. An experience available anytime, anywhere and linked to the company’s mission: refreshing the world and inspiring moments of happiness. This experience should bring something positive to your life: something useful, comfortable or more emotional like fun, entertainment, etc. Format: A presentation of 4 pages maximum with illustration and text. Entries will be accepted till December 10, 2017 23:59 UTC!